Nimble is Clean and minimal Multipurpose Retina Ready WordPress Theme design, that is fully responsive, retina-ready and optimized for mobile devices. This theme will help you to build practically any site: from big corporate business sites with catalogue of products to photo studio sites with portfolio, photo albums and video gallery; technology, business, photography… anything that you can imagine! Moreover you can customize background of every page individually! No codding skills required. You can use in any niche business like a corporate, creative, custom background, custom layout, customizable, mobile, photo albums, photography, portfolio, responsive, retina, SEO, woo-commerce, wpml. The theme is SEO friendly ready, its code is optimized for search engines; full supports for most popular SEO-plugins, and you’ll be amazed how easy and natural it is. 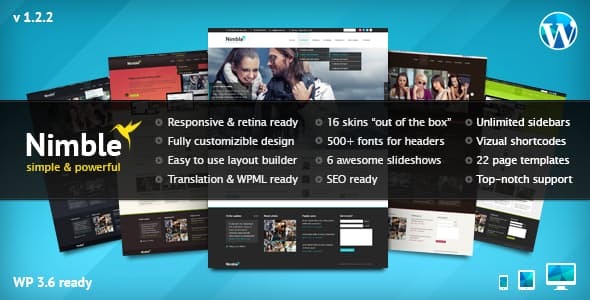 An unlimited number of page layouts with revolutionary layout builder. Create a custom layout with the only couple of clicks in yours. 24 custom shortcodes with a wide range of settings. Like buttons in blog, portfolio and catalogue posts, photo albums and video gallery. Create pages for different types of content in 3 clicks: create a page, select template and hit “publish”. Boom, your page is already there! No additional setup required. Custom post types to store different types of your content: slideshows; photo albums; portfolio; catalogue; video; team; benefits; testimonials; partners, clients, etc. Ajax filtering for portfolio, photo albums, catalogue, photo and video gallery.